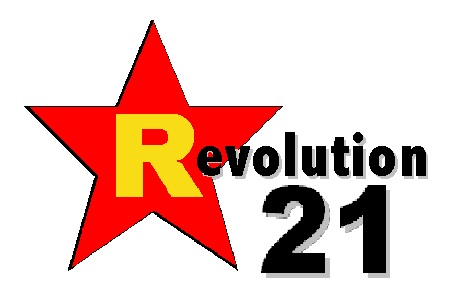 Revolution 21's Blog for the People: Calling Marvin the Martian. . . . It's useful to remember that we don't know what we don't know. And that some of the things we think we know -- or that we try to do, because we want to find out what we don't know -- just might look pretty darned silly in 70 years or so. In 1924, for example, when Mars was at one of its closest approaches to Earth, some radio engineers thought they heard something . . . unearthly, let's say. According to a 1939 article in Radex magazine, some thought the signals originated on Mars. It appears that most scientists believe now that life is hardly possible on Mars, but some, particularly the late Dr. Lowell, have believed that life exists there. If true, the Martians are living on a dying world, where most of the oxygen has entered the rocks, oxidizing the iron present and rusting it, giving Mars its typical reddish color. Martians would be seeking a new world on which to live, and July 27 would be the obvious time for them to make an attempt at communications. 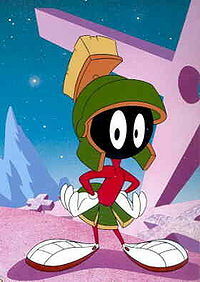 OF COURSE, the little green men coming to Earth would be most impractical. Orson Welles' interplanetary invaders of the previous year were ultimately done in by something as simple as . . . Earth germs. They'd all have to be little green versions of the Boy in the Plastic Bubble. If germ-free plastic bubbles had been invented yet. Nobody knows whether or not there is animal life on the planet Mars; nobody knows whether or not it is possible to reach Mars with a radio signal. In 1924 a group of radio engineers trying to tune in Mars heard signals which they claimed they could not identify with an Earthly source. Last week, with Mars closer to the Earth than at any time since 1924, another group of radio engineers tried a more daring experiment: sending a signal Marsward in the hope that it would be reflected back, picked up again on Earth. They thought they might succeed if: 1) the signal could penetrate the ionosphere, the ionized layer in the Earth's atmosphere whose influence on radio waves is not thoroughly understood; 2) it was not dissipated or destroyed on the way; 3) it hit Mars; 4) it was reflected toward Earth, and strong enough to be detected. At the headquarters of Press Wireless, surrounded by the barren salt marshes off Baldwin, Long Island, gathered engineers of Newark's publicity-wise Station WOR, good-natured Curator Clyde Fisher of Manhattan's Hayden Planetarium, newshawks, photographers, announcers standing by to tell all. Before sending their signal, the engineers spent forty-five minutes twirling the knobs of 40 short-wave receivers, trying to catch a signal from Mars, where the highest form of life is generally believed to be some low form of vegetation, possibly resembling moss. Result: a potpourri of short-wave noises, most of them promptly identified. BUMMER. That crafty Marvin probably was maintaining radio silence as he plotted his sneak attack on Earth. Oh, wait. That was the Japanese. Target in two years: Pearl Harbor, Hawaii. Then again, we didn't know what we didn't know. And more doctors smoke Camels than any other cigarette.